Rome – More than 48 000 immigrants from Libya and Tunisia have arrived in Italy since the beginning of the year, Interior Minister Roberto Maroni said on Monday. Official statistics showed that up to July 31, 24 769 immigrants had come from Tunisia and 23 267 from Libya, many of them originally from sub-Saharan Africa who fled the unrest in their host country. In the case of Tunisia, there has been contact with the Tunisian government “which has agreed to monitor”, the situation, said Maroni, who added that two repatriation flights were taking place every day. “Ten days ago I met with the National Transitional Council’s interior minister but this body has been disbanded,” he said of the Libyan situation. “As long as there is war, immigration control will not be possible,” said Maroni whose Northern League party wants a rapid withdrawal from Nato operations in Libya. Of the 48 036 immigrants, 13 667 have been repatriated. “We want to reach 30 000 by the end of the year,” said Maroni during the interior ministry’s annual conference. Maroni said he signed on Monday an order updating the repatriation assistance guidelines. Among those arriving from Libya claiming asylum “we think 35% to 40% will receive refugee status,” he said. At the weekend around 2 000 migrants arrived on the southern Italian island of Lampedusa, midway between Sicily and the North African coast. Coastguard meanwhile intercepted 23 would-be immigrants off the Algerian coast overnight on Sunday. 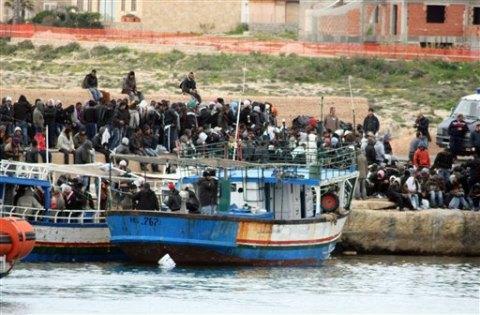 They were arrested on their boat off the Annaba region, where many attempt to flee Algeria for the Italian coast.